The National Association of Intercollegiate Gymnastics Clubs (NAIGC) is expecting its 31st annual National Championships to be the largest one yet. This year’s event will showcase over 1,500 men’s and women’s gymnastics competitors from 111 collegiate and adult clubs throughout the nation. Many new individuals and clubs will get a warm welcome from all of the returning participants. From high flying tumblers to graceful dancers, there is a niche for everyone at this year’s nationals. The NAIGC is proud to announce the addition of Tumbling and Trampoline to its available disciplines, alongside Men’s and Women’s Artistic Gymnastics and the NAIGC Gymnastics Decathlon, which allows gymnast to compete in all 10 Men’s and Women’s Artistic Gymnastics events. Preliminary Competition: Thursday – Friday 8:30 a.m. – 9 p.m.
Finals Competition: Saturday 11 a.m. – 4 p.m. The Championships will feature competition in Women’s Artistic USAG Levels 7, 8, modified Level 9, along with a new NAIGC Developmental Level for women, and Men’s Artistic Modified NCAA Level, modified USAG Level 9, and Men’s NAIGC Developmental. This year, all competitors of a given level will battle for a place in finals, regardless of collegiate status. Awards will be given in two categories, collegiate and community. There will be six preliminary sessions of competition, and then top competitors will qualify to Finals to determine the winners in the Team, All-Around, and Individual Event competitions. Sizing up the competition for this year, many favorites are returning across the board. We received member feedback that some adults wanted to be recognized among only adults, and other adults wanted to compete against collegiate students. We restructured our competition format, awards and score display on the website to better meet the needs of our membership. In the Men’s Modified NCAA, 2018 Open Division Champion, UC Berkeley will be returning to defend their team title in the community category. Last year’s runner up, the NAIGC Alumni will be returning as a team with many familiar faces. AA Champion, Tyler Green (Alumni), and third place finisher, William Suta (Alumni), will both be returning to the community category. 2018 Collegiate champions, Oklahoma State will not be returning this year, which will leave for an exciting battle amongst other collegiate teams, including last year’s runner ups, Arizona State University and Texas A&M University. Third place AA finisher, Jared Miscisin (Texas A&M) will be the only one from the top three finishers of the collegiate division vying for an all-around medal in Daytona. Men’s Developmental 2018 runner-up, Eastern Michigan University, and bronze medaling team, UNC-Chapel Hill will be returning to try to reclaim their national titles. Meanwhile, last year’s Champion, UW- Madison will have individuals competing in men’s developmental, but they will not be competing for a team score. No reigning all around champions will be returning to defend their titles, leaving the Men’s Developmental All-Around podium wide open! Many competitors are switching to the new USAG Level 9 making for an exciting competition. In the Women’s competition, Fort Worth level 6 champions, UC-Davis, will be returning in both Developmental and level 7. Hannah Litchenberger (UC-Davis), the 2018 level 6 champion will also be vying to win the all-around title in Daytona beach this year in L7. In level 8, reigning champions, Grand Valley State University, will try to defend their first national title. Meanwhile, Virginia Tech, who finished third in the level 8 division last year will be attempting to take the title for themselves. Level 8 AA champion, Madeline Brandt (BGSU), will be returning to defend her title as an alumni. For level 9, the NAIGC Alumni team will be returning this year to defend their title, but will have tough competition from last year’s runner-up Texas A&M, and third place Penn State. 2018 level 9 silver medalist, Julie Bouton (Liberty) will be trying to improve upon her second place finish this year, as she is the only from the top three athletes returning. Decathlon reigning champ, Julia Sharpe will be returning to defend her title, however, there will be a close race for the top three spots this year. Additionally, the 2017 and 2018 bronze medalists, Nate Sharpe (MIT) and Mason Marek (Alumni), will both be looking to move up on the podium after alternating third and fourth place the last two years. This ultimate version of the all-around competition is one you won’t want to miss! This year we will also be featuring an additional lower level for the decathlon, extending the experience for more of our membership. The National Association of Intercollegiate Gymnastics Clubs (NAIGC) is dedicated to the promotion and support of collegiate and adult club gymnastics, “For the Love of the Sport.” The NAIGC hosted its first annual national championships in 1989. In 2006, the NAIGC elected its first Board of Directors and incorporated as a non-profit. The NAIGC was recognized as a tax-exempt public charity in 2008. Today, an elected Board of Directors, alongside its Advisors, run the NAIGC. Most of these dedicated volunteers are current and former college club gymnasts. 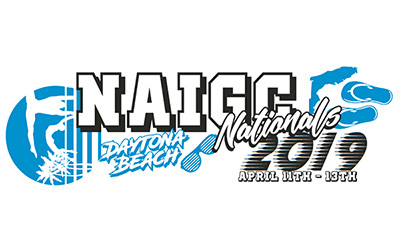 The NAIGC hosts this annual National Championship meet, as well as other gymnastics events throughout the year, and supports its member clubs with variety of technological and administrative services. Club Membership in the NAIGC is open to any collegiate and/or adult community gymnastics club in the United States. Individual Membership is open to any interested person over the age of 18, or any 17 year-old who is enrolled in a college or university. For more information, visit www.naigc.org.